Your employees are a reflection of your restaurant. Whether they’re taking orders or frying fish, your staff needs to look good at all times in order to put the best foot forward for your guests. As a local business, we understand the importance of maintaining a good image in a close-knit community. Your reputation is everything. We’ll outfit your staff in the best with our kitchen and industrial uniforms and aprons. Take a look at our uniforms, then contact us to learn more about our local rental services! 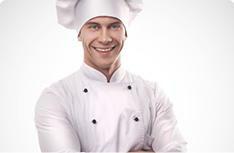 Our functional and stylish chef uniforms will make you consider putting your chefs in the front of the house. 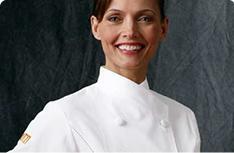 We offer chef coats and pants in black and white. 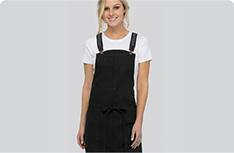 Keep your restaurant cooks comfortable with our line of first-rate cook uniforms. We offer cook shirts in black and white. It’s your responsibility to make sure your employee uniforms are up to the task. 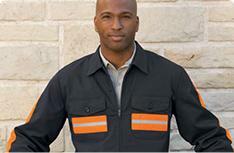 We offer industrial uniform shirts and pants in various colors. Our bib aprons keep your servers clean from head to toe. 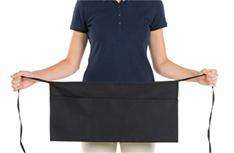 Bistro aprons protect your employees’ legs from stains. 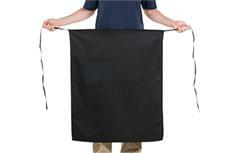 Our waist aprons are the perfect fit for your staff.